Felweed is the first herb you will find in the Outlands, you also will not find it anywhere else except in the Outlands. This makes it a profitable herb to farm, since not many people travel through the Dark Portal to go to the Outlands anyways, especially to farm herbs. Herbalists who level from 60 to 70 will find a lot of Felweed but usually that’s not enough to supply the demand from players leveling alchemy and inscription. Felweed is usually the cheapest of the level 60-70 herbs so it is most often purchased to mill for Nether Pigment (for inscription). Check your auction house prices to determine if Felweed is a good herb for you to farm. 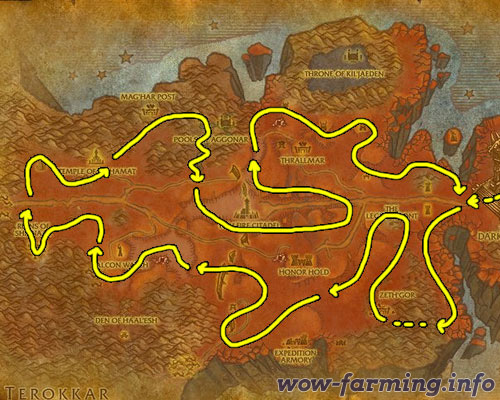 You can farm it as soon as you can get into the Outlands, which is usually level 58. You will also need level 300 Herbalism and an epic mount is a huge bonus. Update: You can make a lot of gold with Felweed, but if you want to step it up and make thousands of gold you should read my personal favorite guide. The best place to farm Felweed is in Hellfire Peninsula. You will also find a lot of Golden Sansam but by no means is it also a good place to farm Golden Sansam. There’s not really a good route to follow, Felweed is scattered just about everywhere in Hellfire Peninsula, so you’ll have to do a lot of zig zagging and broad scans of areas. 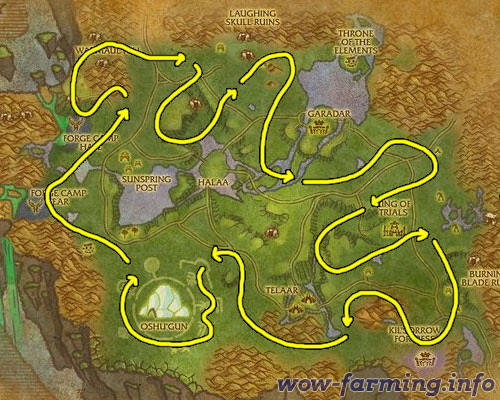 I came up with this route specifically for farming Felweed and it works pretty good. It covers the high density areas and avoids the areas without a lot of herbs.